Applying kajal is way simpler than removing it from the eyes. But if you remember the post 10 smart rules every girl should live by, removing makeup before going to bed is very crucial – your pores become more clogged which attracts the acne-causing bacteria. Sleeping in eye makeup repeatedly may result in the clogging of the tiny hair follicles and oil glands on your eyelids causing the formation of styes and other eye infections. 1. 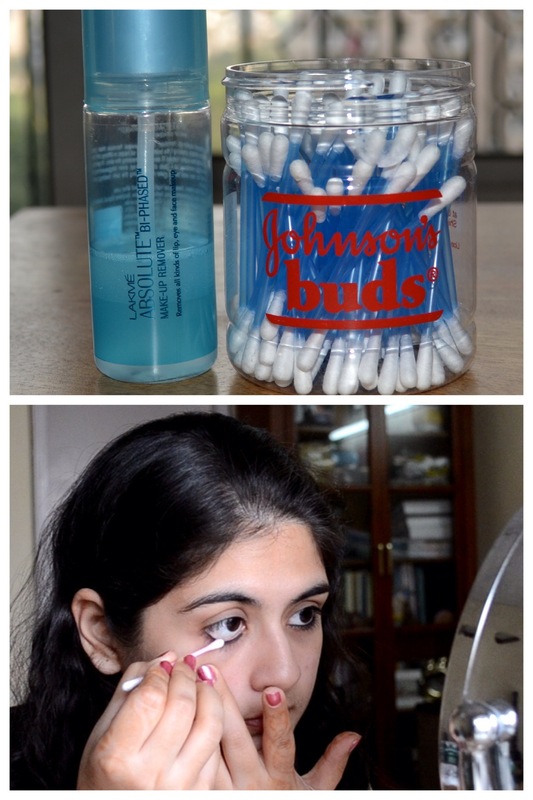 Dip a cotton bud in some makeup remover and gently rub inside the waterline. Wash the face with your regular face wash and follow up with an eye cream. 2. 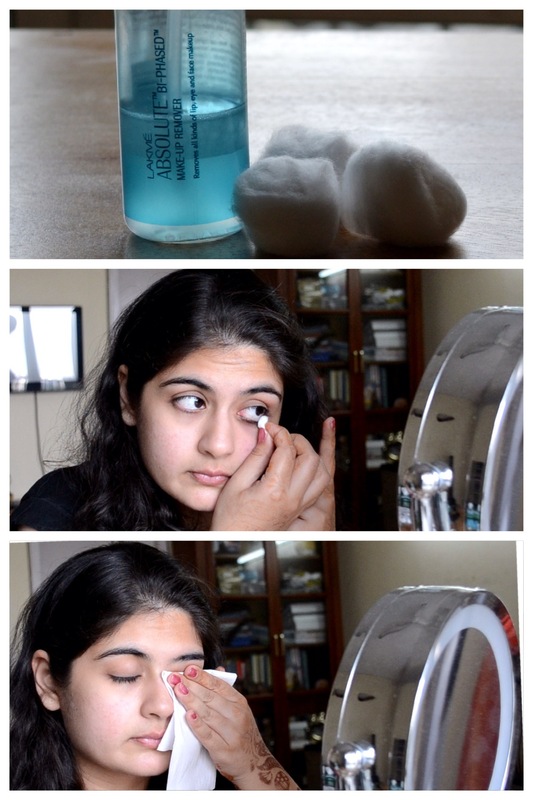 Take a small ball of cotton and dip it in some makeup remover/oilive oil and drag the cotton from inner to outer corner and vice-versa. 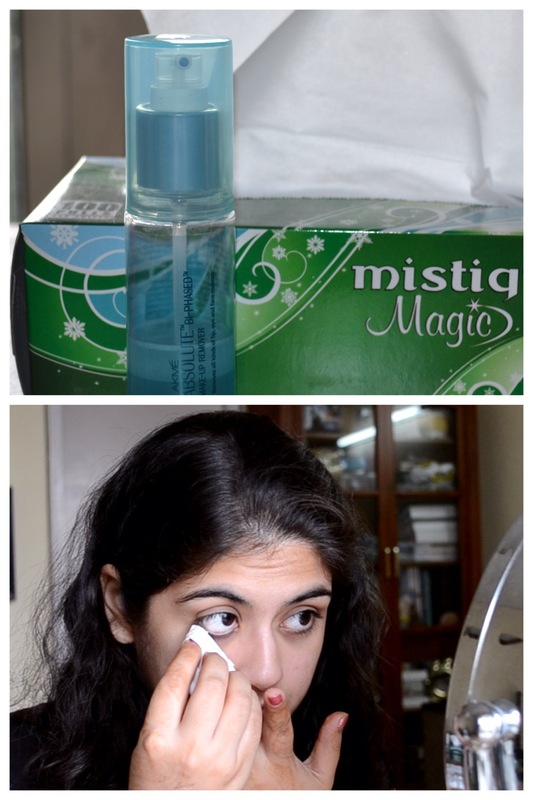 To remove the excess oil from the eyes, grab a tissue and gently pat around the area. 3. In case if you do not have either – a bud or cotton, take a tissue and dip in makeup remover or olive oil and remove the kajal from the eyes. Don’t make this a habit as tissues are not as soft and gentle as cotton. Makeup removers come in two kinds – a regular remover which has properties of removing regular makeup (not waterproof) and the other being a dual-phase formula with half solution and half oil which is best to remove any kind of water proof makeup. These days many brands have started making the dual formula as majority of the cosmetics have become either water resistant, i.e. designed to resist but not entirely prevent the penetration of water or water proof, i.e. unaffected by water. The easiest and simplest way to remove any form of makeup especially kajal from the eyes is by using OLIVE OIL as it dissolves the impurities without any sort of harsh chemicals or skin irritating cleansers. It helps to repair your skin, gives it a youthful glow and doesn’t block pores. Mothers would apply kohl to their infants’ eyes soon after birth. Some did this to “strengthen the child’s eyes”, and others believed it could prevent the child from being cursed by the evil eye,i.e. buri nazar. In the centuries-old Indian Bharatnatayam dances, the dancers apply heavy kohl to their eyes so as to draw attention to their eye gestures and movement.